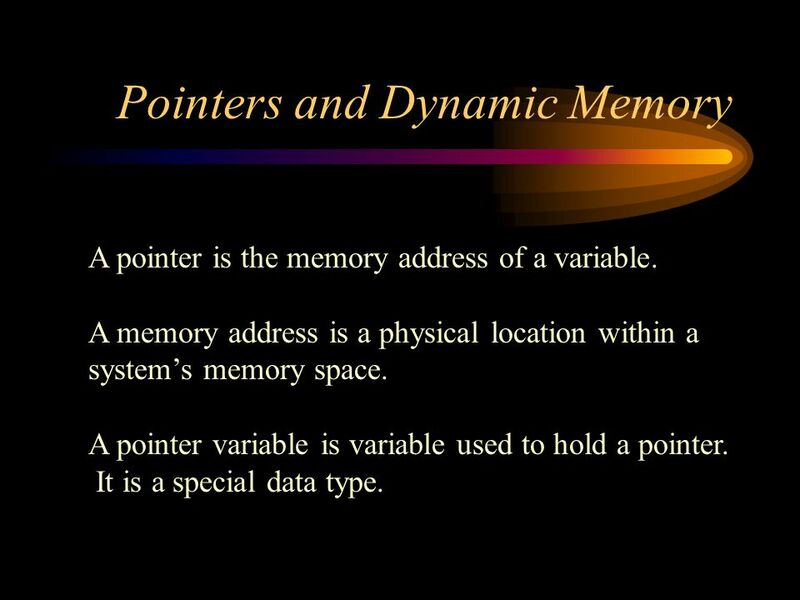 A pointer is the memory address of a variable. 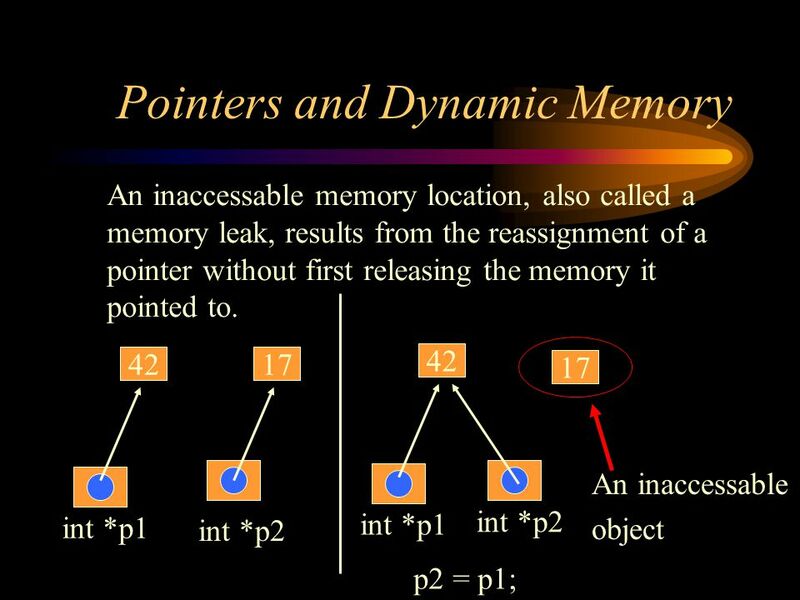 A memory address is a physical location within a system’s memory space. 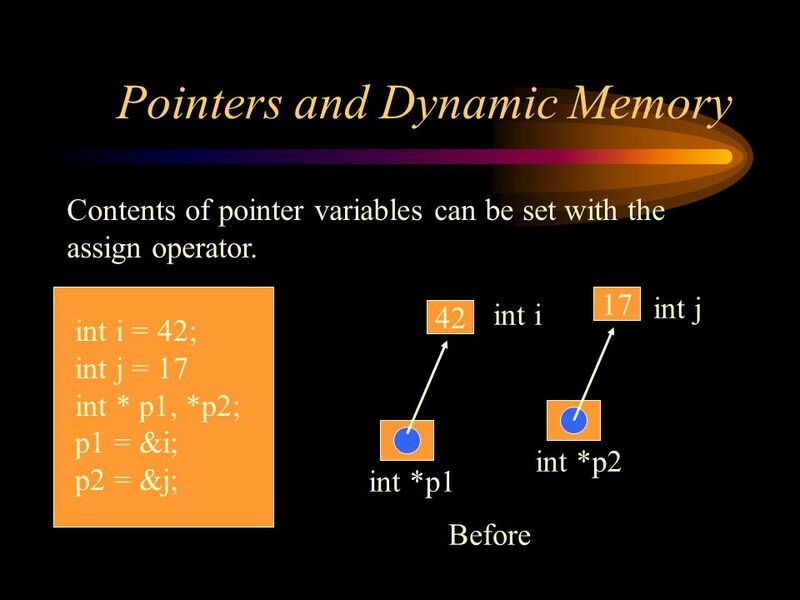 A pointer variable is variable used. 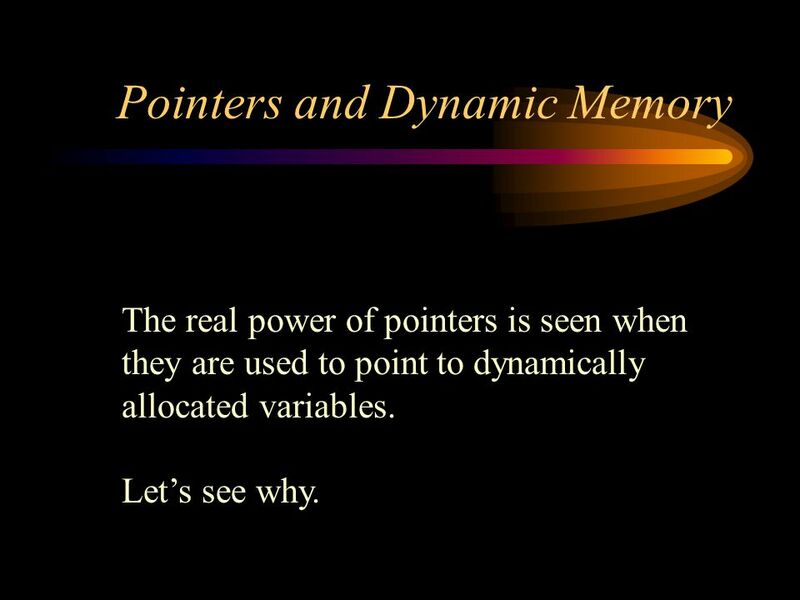 9 Pointers and Dynamic Memory The real power of pointers is seen when they are used to point to dynamically allocated variables. Let’s see why. 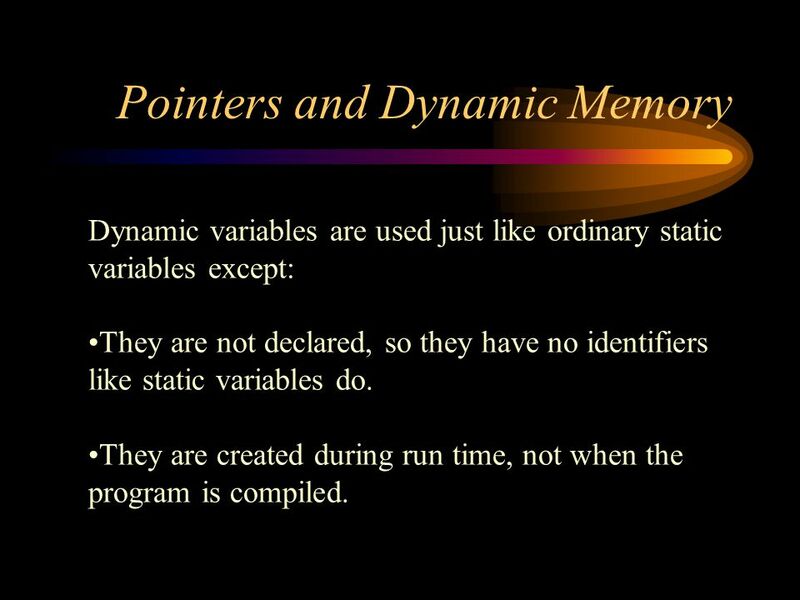 10 Pointers and Dynamic Memory Dynamic variables are used just like ordinary static variables except: They are not declared, so they have no identifiers like static variables do. They are created during run time, not when the program is compiled. 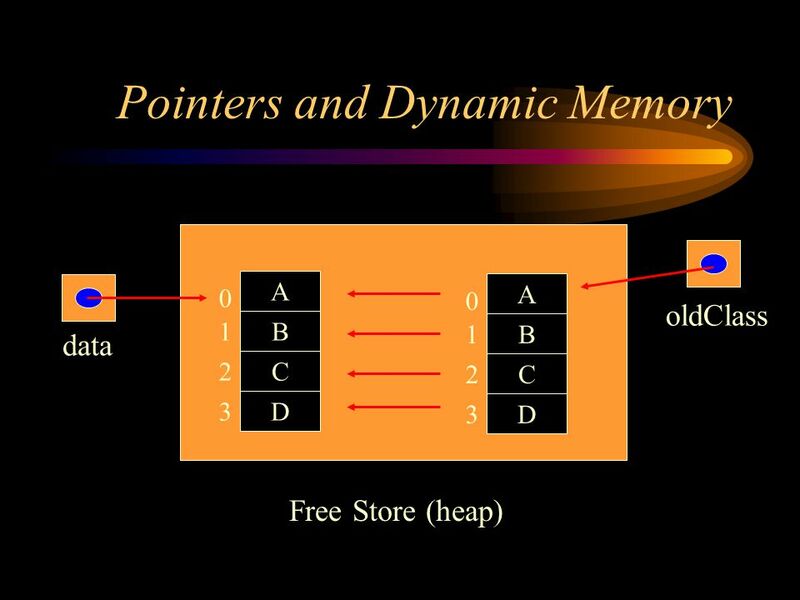 11 Pointers and Dynamic Memory Storage for these variables comes from an area of memory called the free store or the heap. 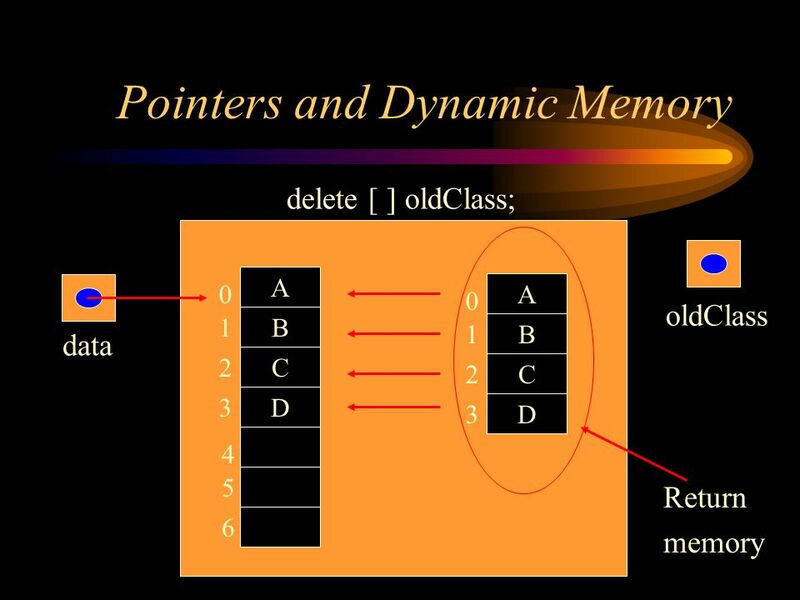 The creation of new dynamic variables is called memory allocation and the memory is called dynamic memory. 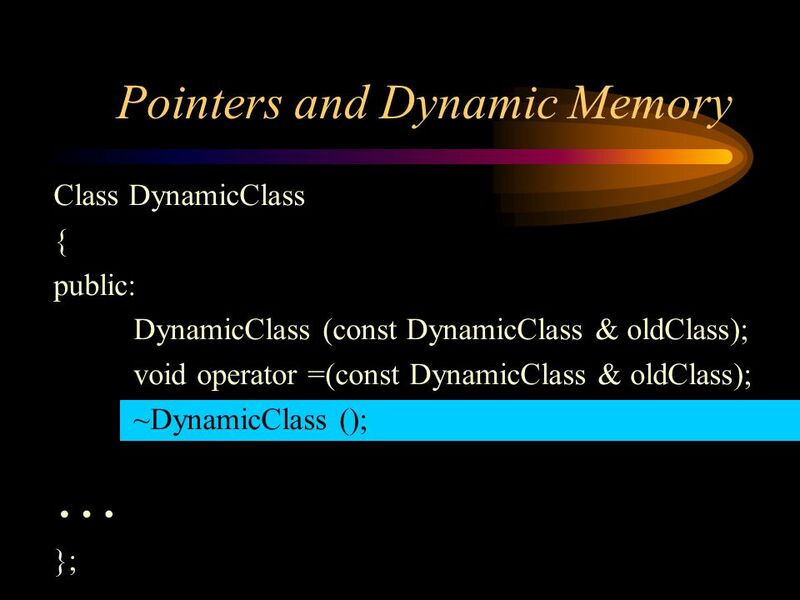 C++ uses the new operator create a dynamic variable. 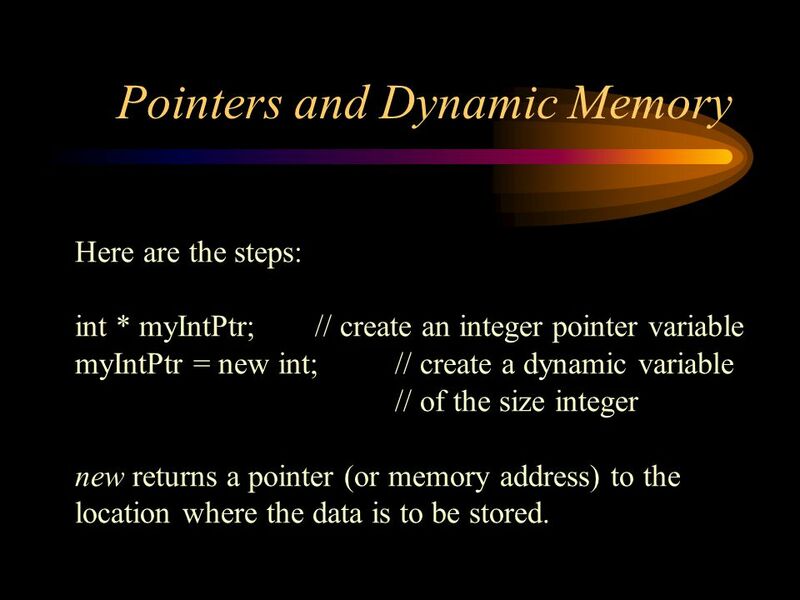 12 Pointers and Dynamic Memory Here are the steps: int * myIntPtr; // create an integer pointer variable myIntPtr = new int; // create a dynamic variable // of the size integer new returns a pointer (or memory address) to the location where the data is to be stored. 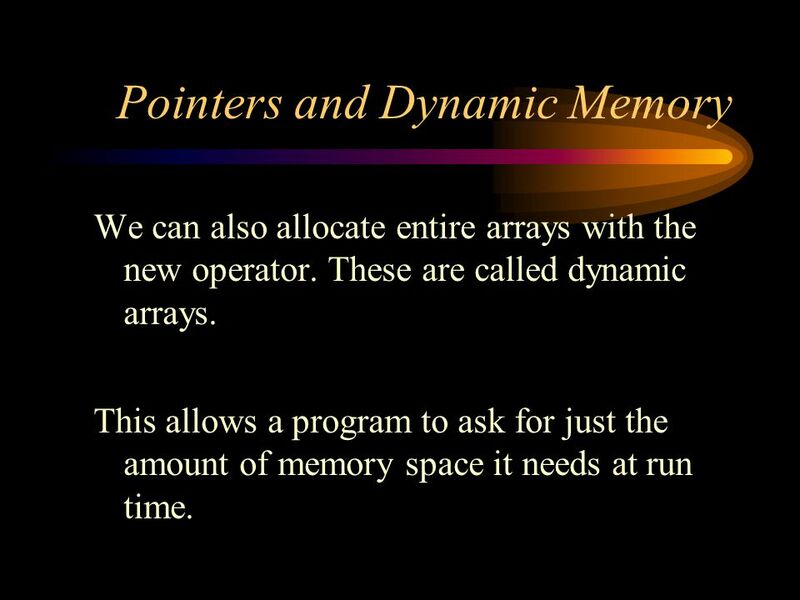 15 Pointers and Dynamic Memory We can also allocate entire arrays with the new operator. These are called dynamic arrays. This allows a program to ask for just the amount of memory space it needs at run time. 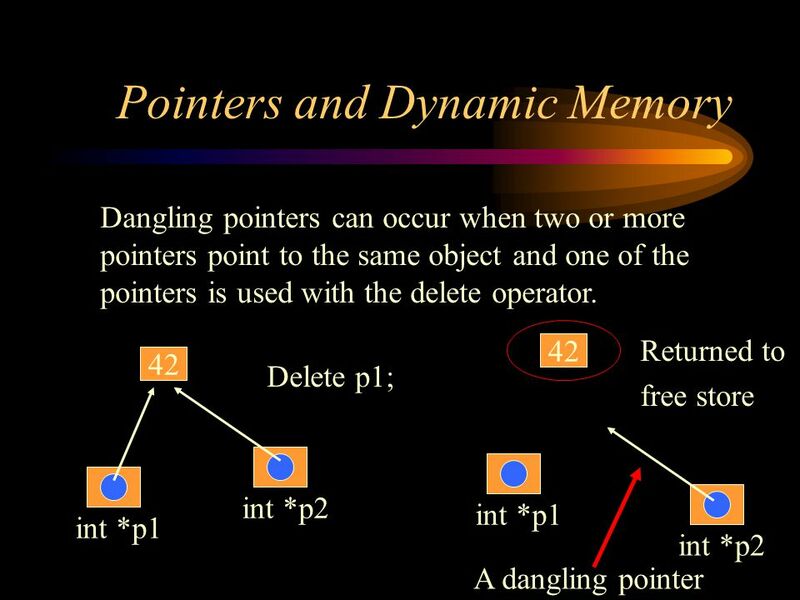 24 Pointers and Dynamic Memory Some things to be careful with when using pointers. 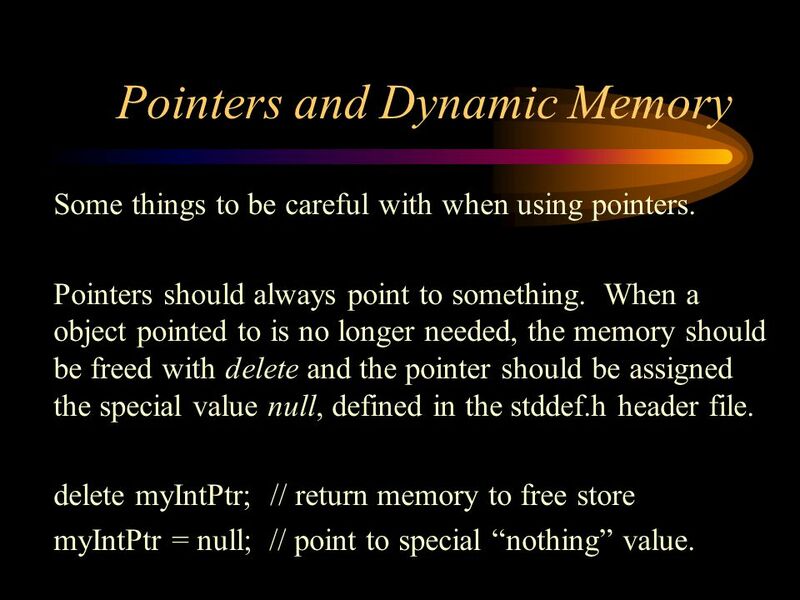 Pointers should always point to something. When a object pointed to is no longer needed, the memory should be freed with delete and the pointer should be assigned the special value null, defined in the stddef.h header file. 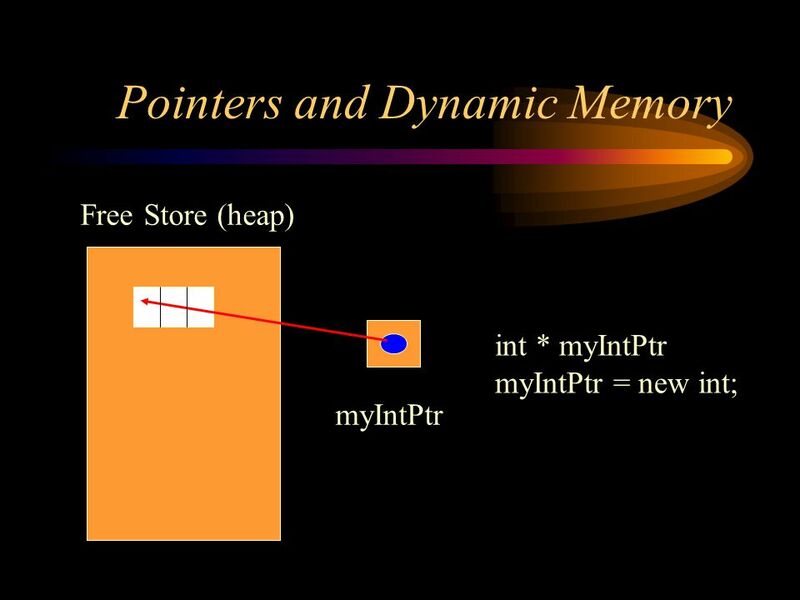 delete myIntPtr; // return memory to free store myIntPtr = null; // point to special “nothing” value. 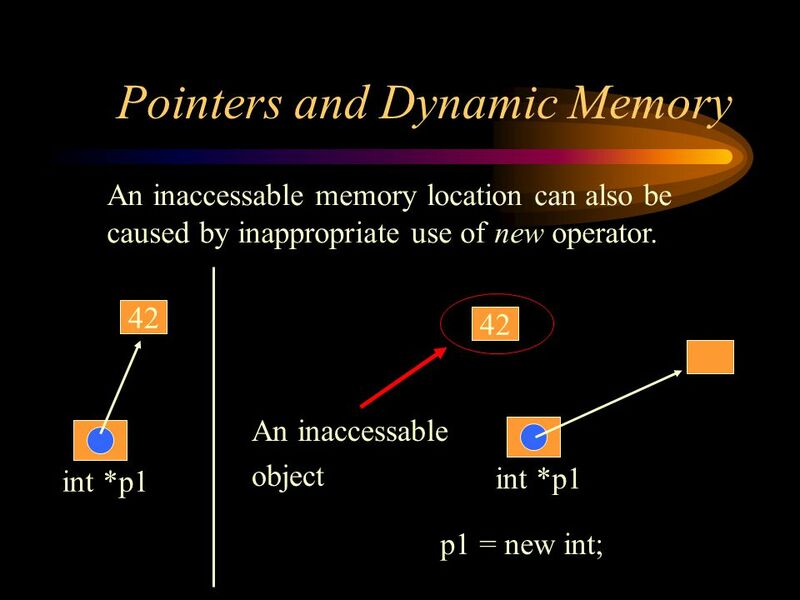 25 Pointers and Dynamic Memory A pointer not pointing to an object is considered “unassigned”. 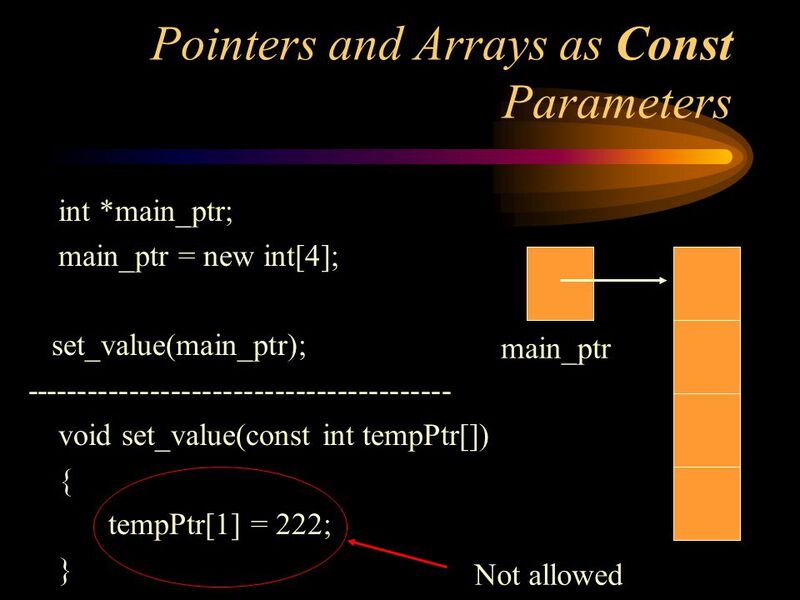 An unassigned pointer variable must not be dereferenced. 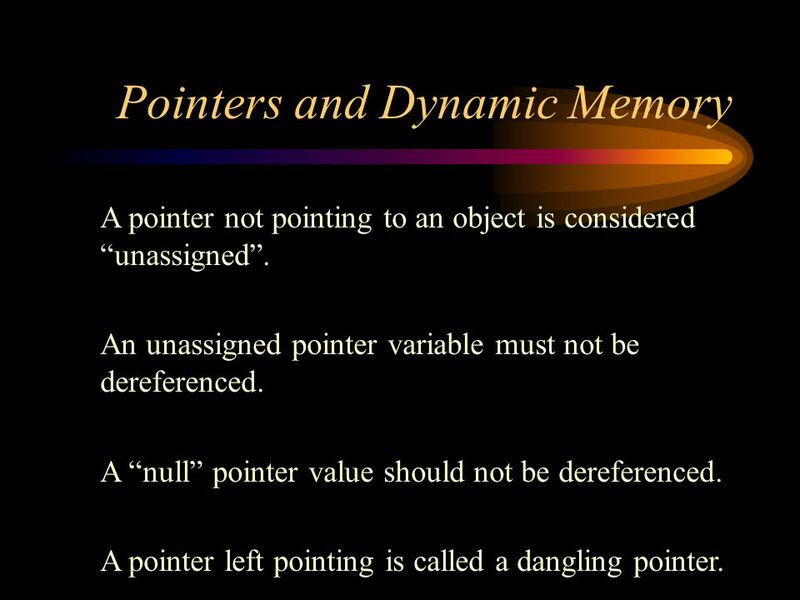 A “null” pointer value should not be dereferenced. A pointer left pointing is called a dangling pointer. 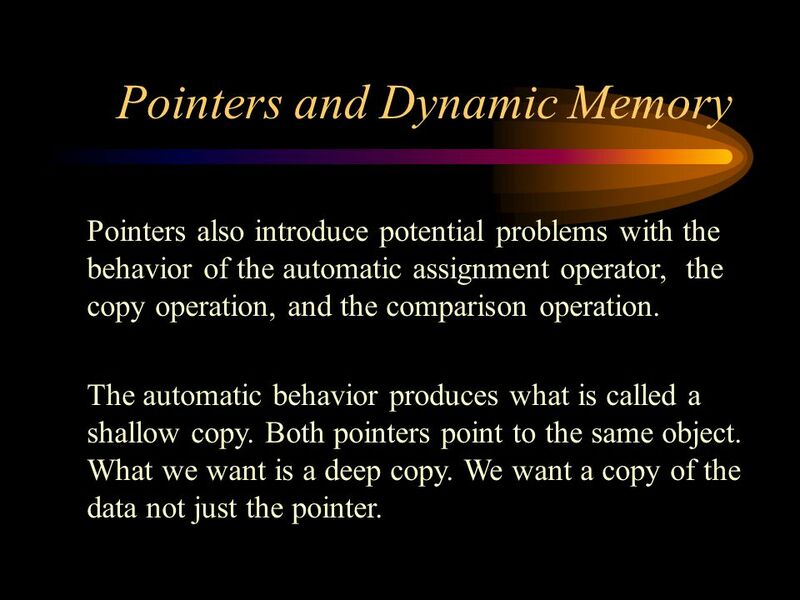 29 Pointers and Dynamic Memory Pointers also introduce potential problems with the behavior of the automatic assignment operator, the copy operation, and the comparison operation. The automatic behavior produces what is called a shallow copy. 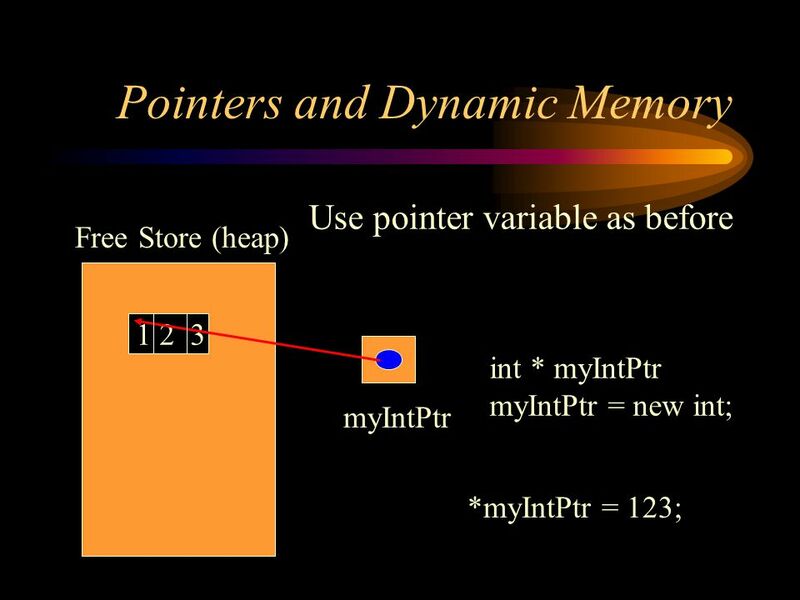 Both pointers point to the same object. What we want is a deep copy. We want a copy of the data not just the pointer. 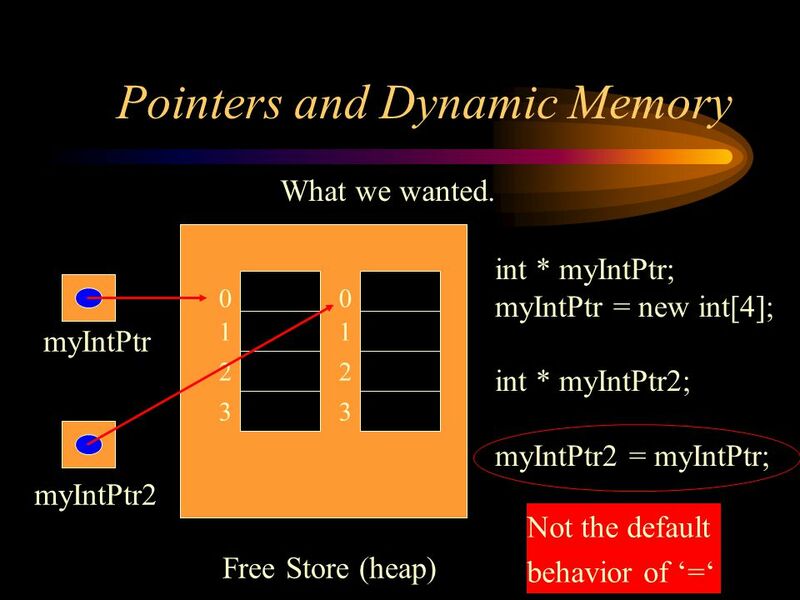 30 Pointers and Dynamic Memory Free Store (heap) myIntPtr int * myIntPtr; myIntPtr = new int; int * myIntPtr2; myIntPtr2 = myIntPtr; 0 2 1 3 myIntPtr2 0 2 1 3 Not the default behavior of ‘=‘ What we wanted. 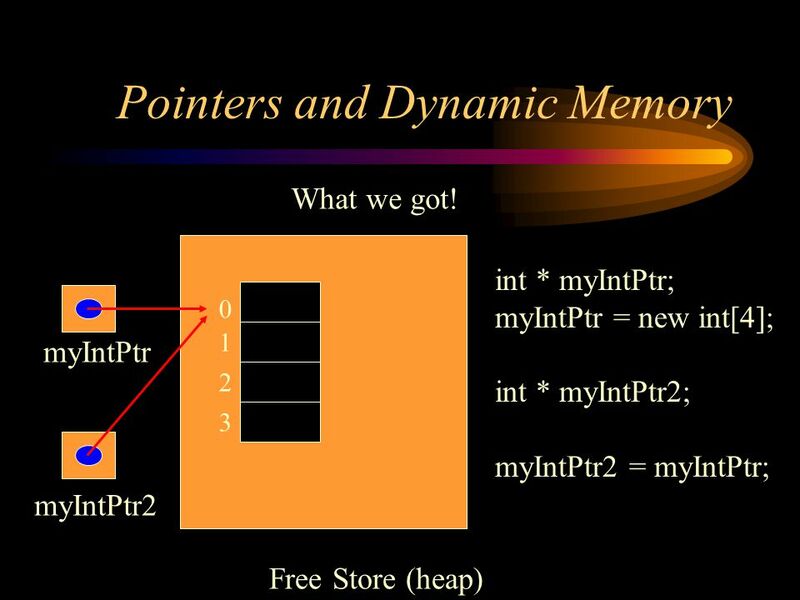 31 Pointers and Dynamic Memory Free Store (heap) myIntPtr int * myIntPtr; myIntPtr = new int; int * myIntPtr2; myIntPtr2 = myIntPtr; 0 2 1 3 myIntPtr2 What we got! 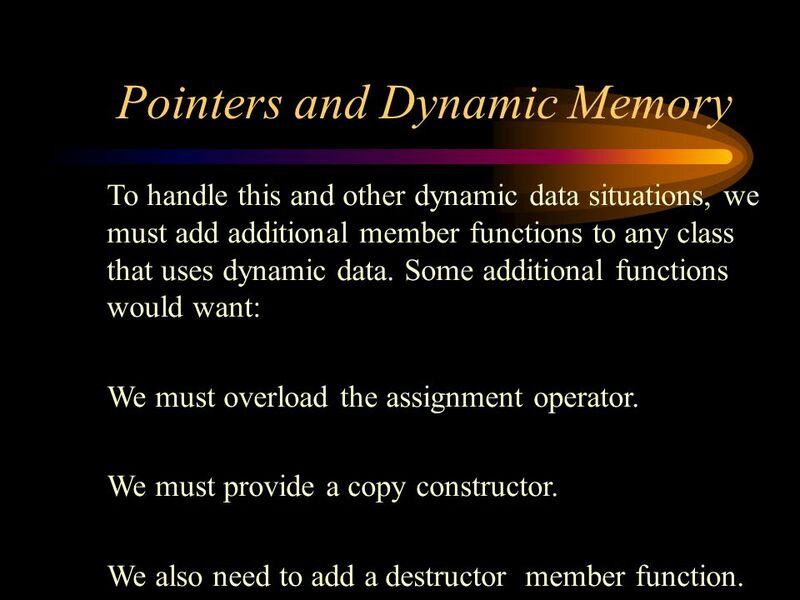 32 Pointers and Dynamic Memory To handle this and other dynamic data situations, we must add additional member functions to any class that uses dynamic data. 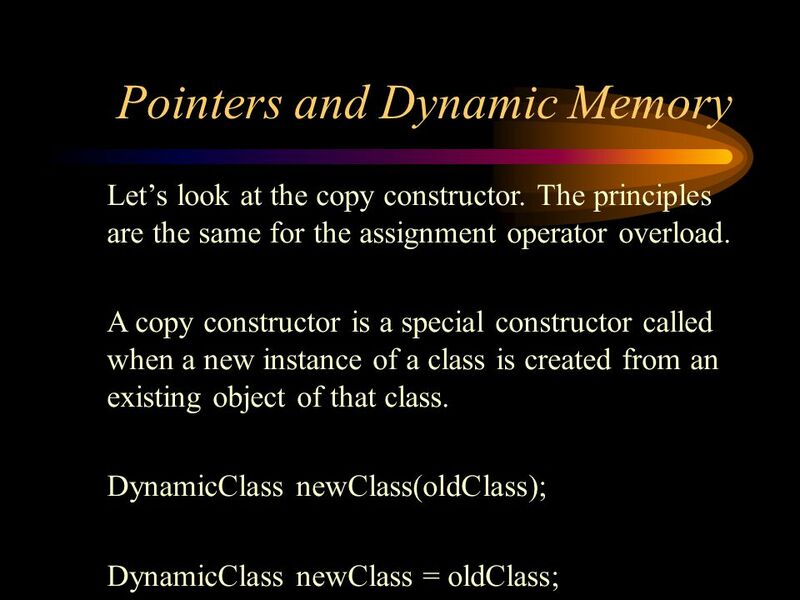 Some additional functions would want: We must overload the assignment operator. We must provide a copy constructor. We also need to add a destructor member function. 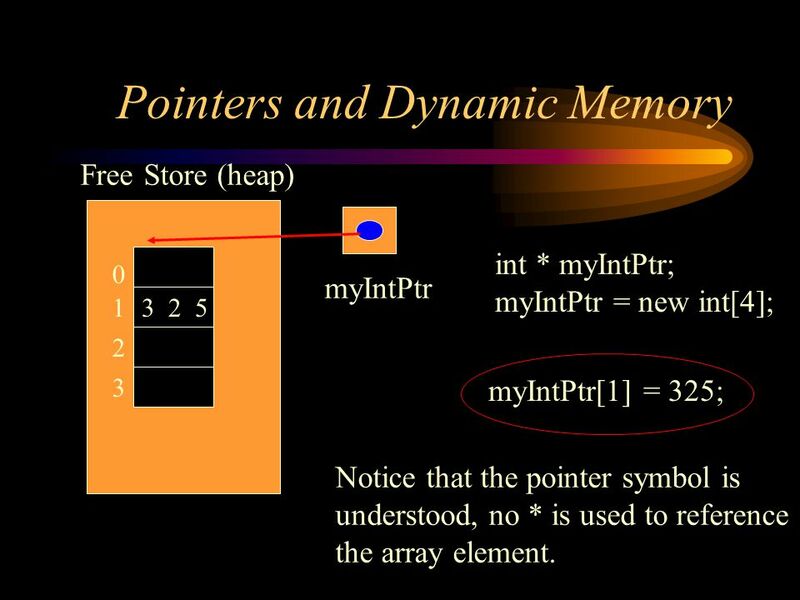 37 Pointers and Dynamic Memory Now let’s apply what we’ve learned to resizing a dynamically allocated array. When the capacity of the original array is used up, we want to allocate a new larger array and copy the data from the original array to the new larger array. 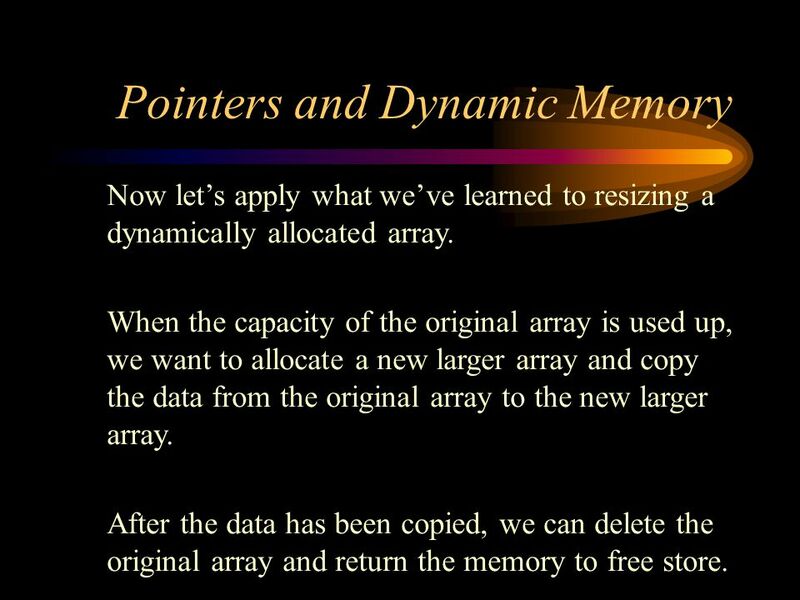 After the data has been copied, we can delete the original array and return the memory to free store. 42 Pointers and Dynamic Memory The use of pointers and dynamic variables is an important problem solving tool. It gives the class builder flexibility in managing memory. It’s use does require more care on the part of the programmer, since control is now in the hands of the programmer and not the system. 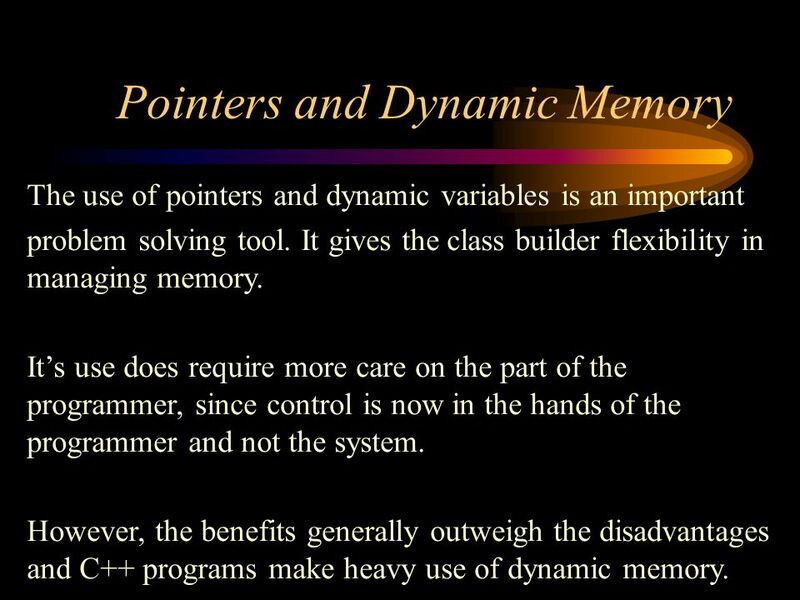 However, the benefits generally outweigh the disadvantages and C++ programs make heavy use of dynamic memory. 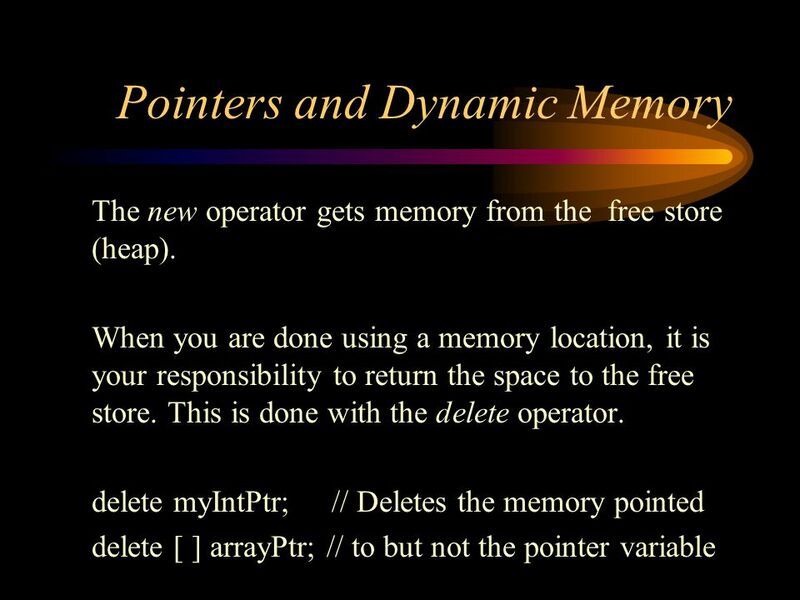 Download ppt "A pointer is the memory address of a variable. A memory address is a physical location within a system’s memory space. 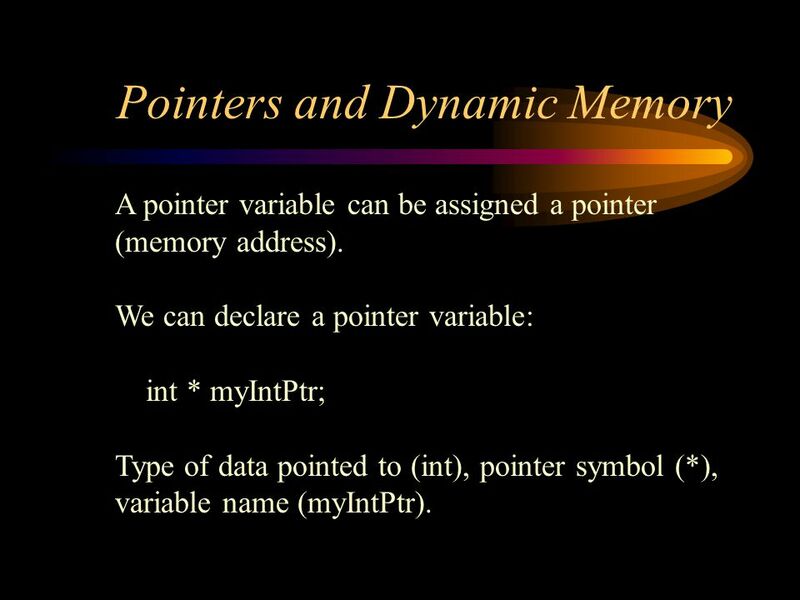 A pointer variable is variable used." Chapter 10 Pointers and Dynamic Arrays. Copyright © 2006 Pearson Addison-Wesley. 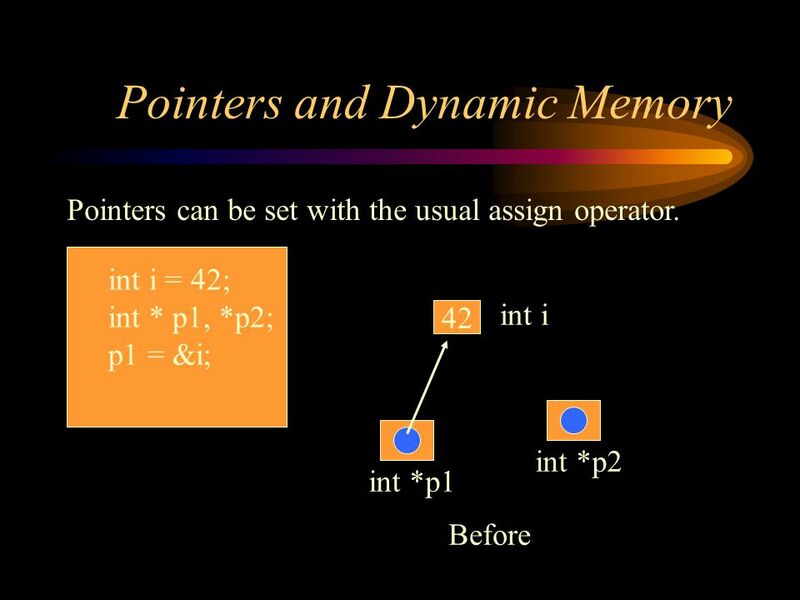 All rights reserved Learning Objectives Pointers Pointer variables.  Pointers, Arrays, Destructors Is this random stuff or are these somehow connected? 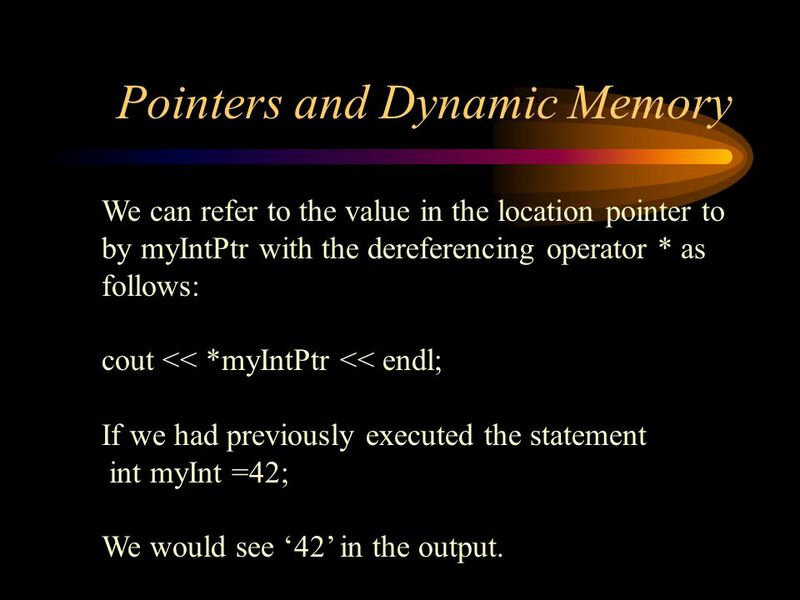 Call By Address Parameters (Pointers) Chapter 5. Functions that “return” more than a single value What if we need more than one value to be returned from. 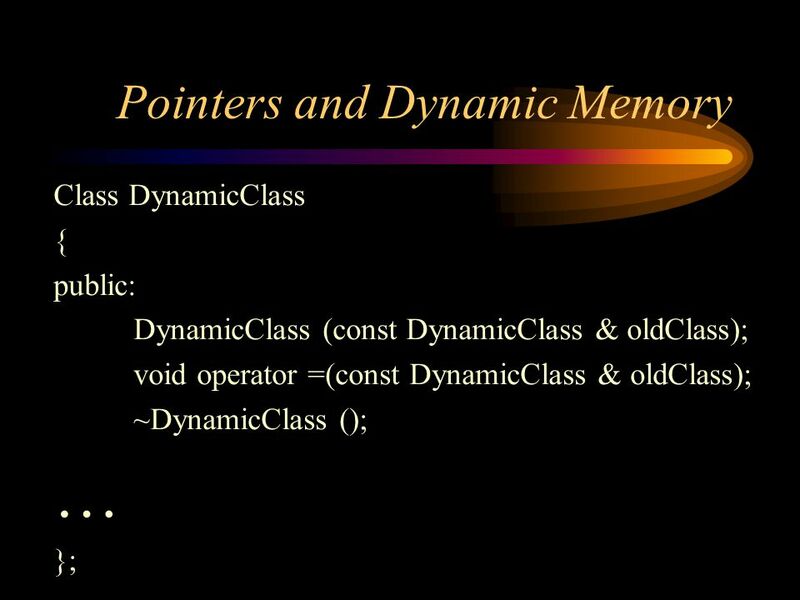 Introduction to Programming Lecture 15. 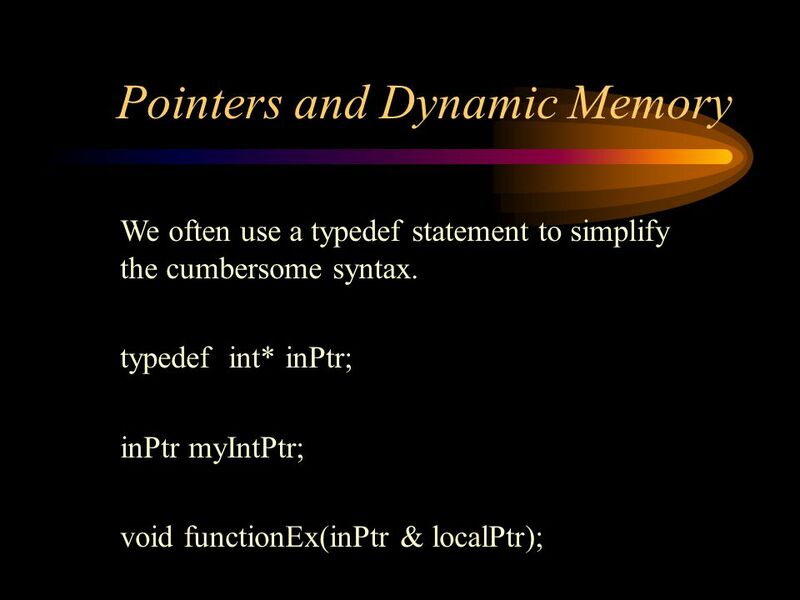 In Today’s Lecture Pointers and Arrays Manipulations Pointers and Arrays Manipulations Pointers Expression Pointers. 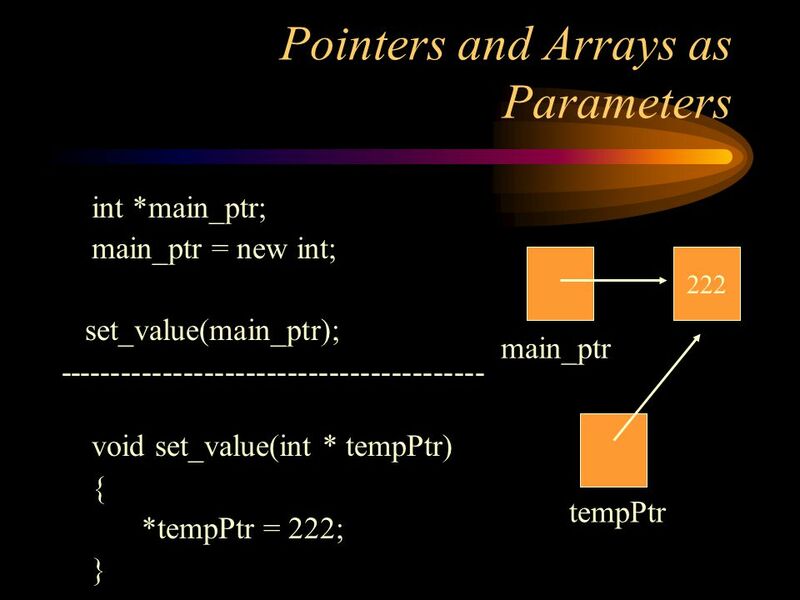 Derived data types Dealing with data –Where the information is stored –What value is kept there –What kind of information is stored Address operator Pointers. 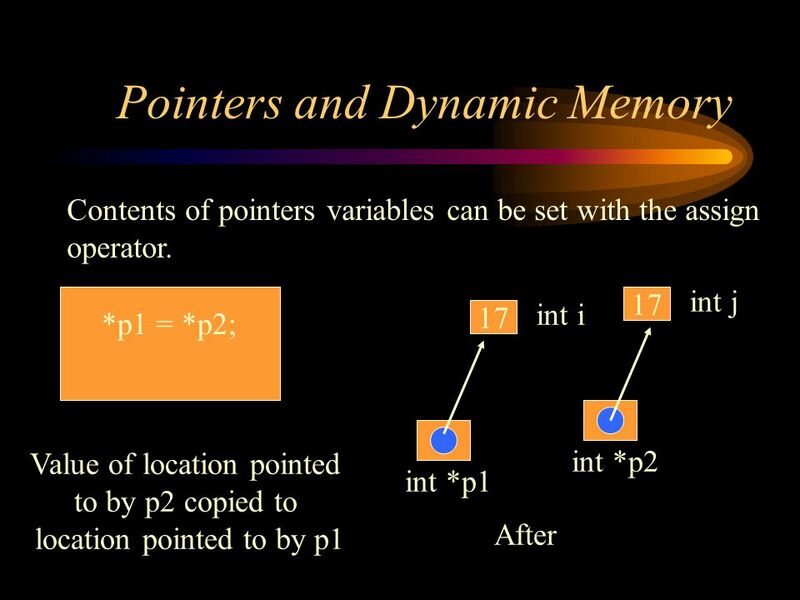 Chapter 9 Pointers and Dynamic Arrays. 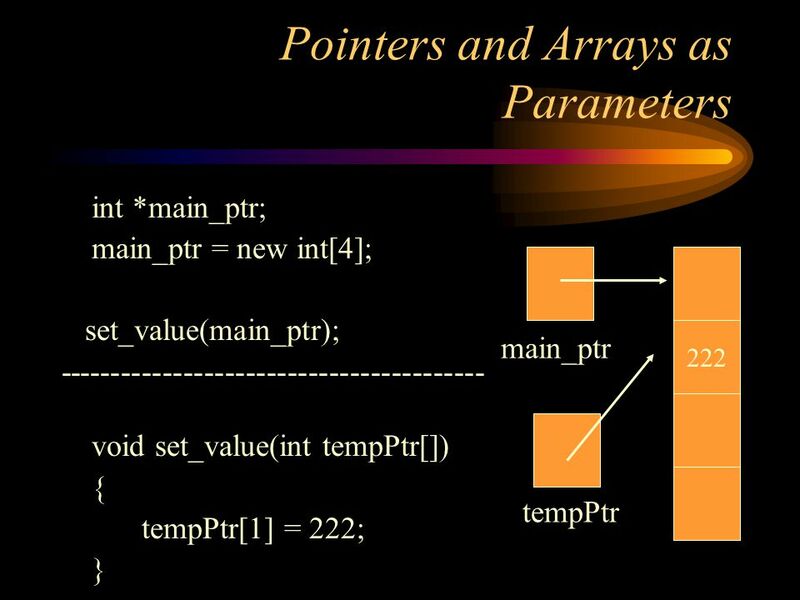 Overview 9.1 Pointers 9.2 Dynamic Arrays. 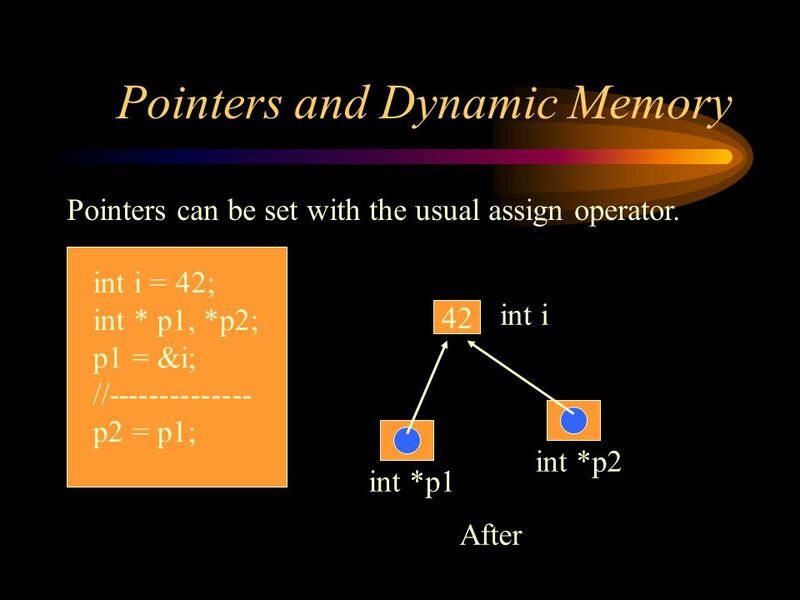 Data Structures (Second Part) Lecture 2 : Pointers Bong-Soo Sohn Assistant Professor School of Computer Science and Engineering Chung-Ang University. 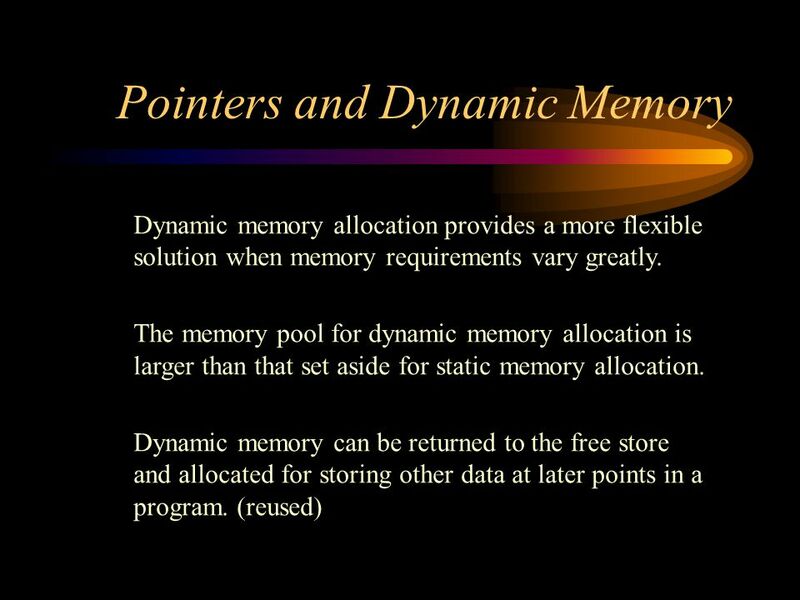 Dynamic Memory Allocation (also see pointers lectures) -L. Grewe. © Janice Regan, CMPT 128, February CMPT 128: Introduction to Computing Science for Engineering Students Pointers. 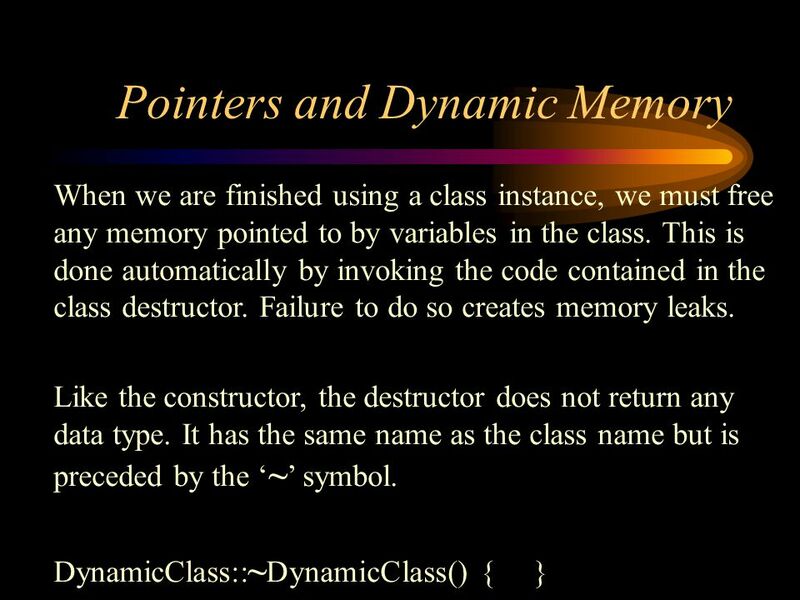 Introduction to Programming Lecture 39. Copy Constructor. 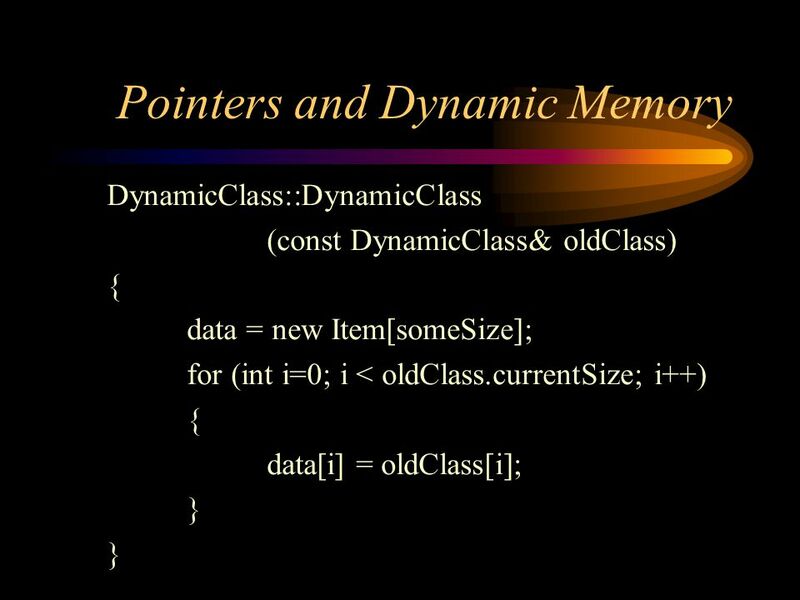 Pointers & Dynamic Memory Allocation Mugurel Ionu Andreica Spring 2012. 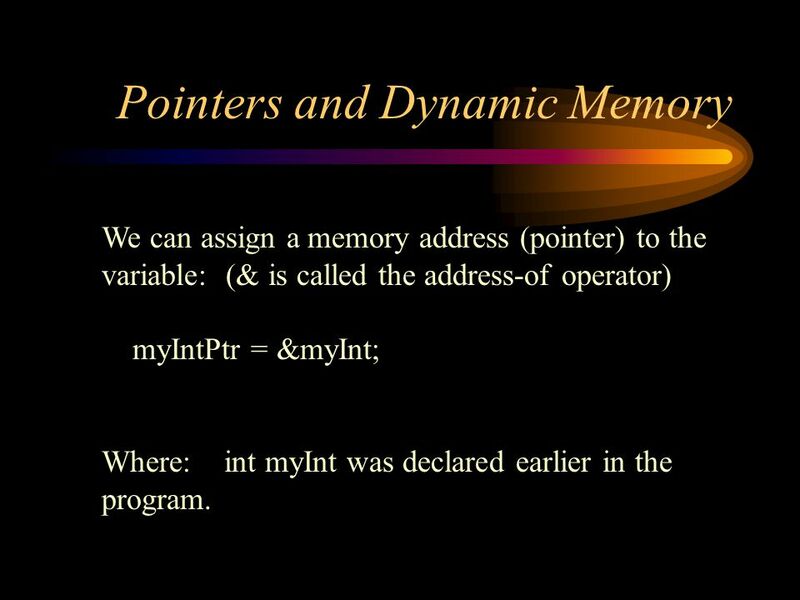 1 Pointers A pointer variable holds an address We may add or subtract an integer to get a different address. Adding an integer k to a pointer p with base. CSE 2501 Review Declaring a variable allocates space for the type of datum it is to store int x; // allocates space for an int int *px; // allocates space. Copyright © 2006 Pearson Addison-Wesley. All rights reserved. 10-1 Learning Objectives  Pointers  * symbol and & symbol  Pointer operations  Pointer.